Guerilla Warfare was a possible unreleased game. As of right now, the only reference to a game titled "Guerilla Warfare" is from a Chips & Bits advertisement from the May 1992 issue of Gamepro. 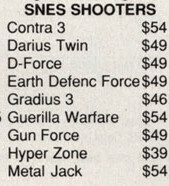 I have no idea if it was related to the similarly titled NES game "Guerilla War", or if it was released under a different title. It was listed under the genre "shooter". I also don't have a developer or publisher attached to this title, so it will likely remain a mystery.